Duanesburg is on the western edge of Schenectady County, about 25 miles west of Albany and about 12 miles southwest of Schenectady. It's easily accessible via I-88, NY-7, and US-20. Duanesburg is a town. It includes the village of Delanson and a bunch of hamlets, among them the hamlet of Duanesburg. Other hamlets include Quaker Street and Mariaville. To make it easier, people often just refer to all these places as "Duanesburg." These numbers are for the town of Duanesburg. They're from Census Bureau 2012 estimates (except where linked below). 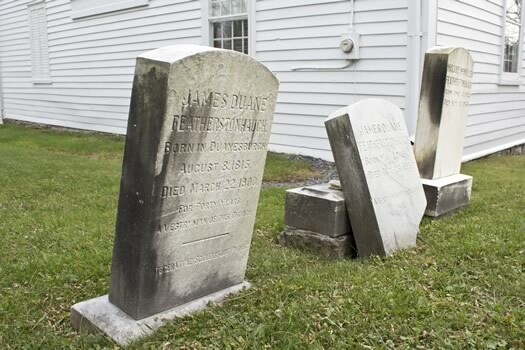 Duanesburg was settled in the mid 1700s, primarily by English Quakers. It was established as a township on March 13, 1765. By that time James Duane owned the largest share of the area, at 50,000 acres, and the town was named in his honor. Duane had quite the career. He started out as a lawyer and eventually became the provincial attorney general for New York. As tensions between the colonies and British stirred, Duane became a delegate to the Continental Congress in 1774. (Though apparently he was conflicted about leaving the empire -- he didn't sign the Declaration of Independence.) After the revolution, Duane would become the first American mayor of New York City (and 44th overall). He also served in the state Senate. And George Washington appointed him the first judge of the United States District Court for the District of New York. Another odd historical bit about Duane: Duane Street -- and Duane Park -- in Manhattan are named after him. And Duane Reade, the NYC pharmacy chain, is named after Duane Street. There are a number of other notable people involved in Duanesburg's history, like General William North, who was an important part in the development of Schenectady County (he was also married to one of James Duane's daughters). And George William Featherstonhaugh, a US government geologist, was an early advocate for the Albany and Schenectady Railroad. (And guess who he married -- yep, a Duane.). Today Duanesburg is very much a commuter town, with many residents traveling into Albany or Schenectady for work. It still maintains its charm, with 643 structures identified as historic by New York State. Many residents are drawn to the small-community feel and amount of available space in the rural community. "My family moved to Duanesburg 46 years ago in November of 1968.Â My parents were attracted to the area since they were able to purchase a large lot of 42 acres. "Having elbow room", my father called it,Â with woodlands and fields in which to plant apple trees, grow large gardens, and enjoy pastures with horses.Â When I was older and with a family of my own, I returned to the area partially pulled to the area due to the good reputation of the Duanesburg school district, partially pushed out of the City of Schenectady due to the high taxes we'd encountered there." 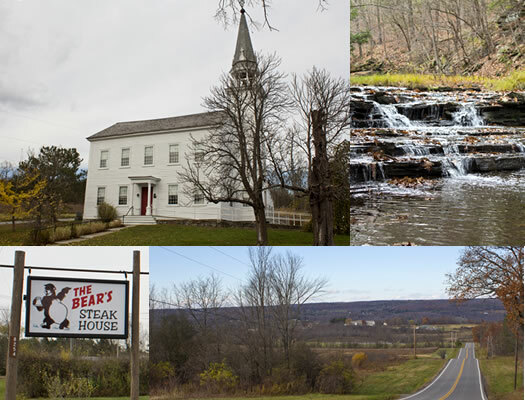 + The town of Duanesburg is the western-most, and largest town in Schenectady county. 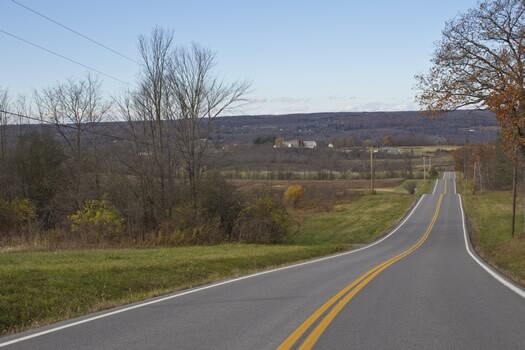 With a total land area of 72 square miles, Duanesburg is just over a third of Schenectady County. + In December 2009, the Duanesburg Center School system's bank accounts were drained of more than $3 million by hackers who transferred the money to foreign accounts. All but $497,200 of the funds was recovered. + James Duane, kind of a big deal that he was, at one point imagined that Duanesburg would become the state capital of New York. + Duanesburg was originally incorporated as Duanesburgh, with an "h" at the end. + The Bear's Steakhouse - The Bear's is well known throughout New York (and perhaps the wider world). Be advised that you'll likely need a reservation -- and when you do, they'll probably ask, "Chateaubriand or prime rib?" + Gibby's Diner - A nice hometown diner located in Delanson. Great if you're looking for generous portions at a reasonable price. 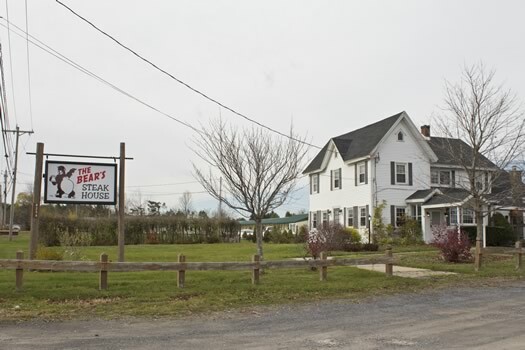 + Duanesburg Diner - This is a quintessential country diner, with a friendly and authentic atmosphere. 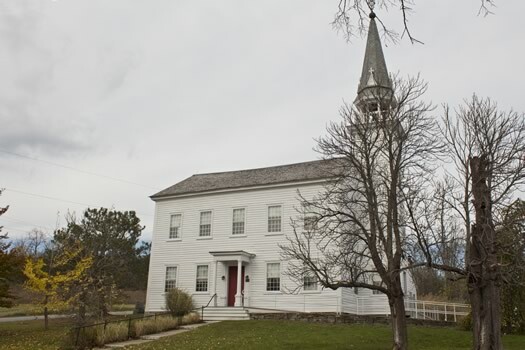 + Christ Church Duanesburg on Route 20 -- This beautiful Episcopal church was built in 1793 with funds provided by James Duane. It is now the oldest unaltered Episcopal church in the state, and Duane is buried beneath the edifice. + Historic buildings -- Since Duanesburg has such a long and rich history, the town is filled with historic buildings. Styles vary, and include Federal, Greek revivals, and Colonial. Of particular note is the Quaker Street Historic District that has 43 properties, including a Quaker Meetinghouse (c. 1807) and the McDonald Shoe Factory (c. 1850). + Christman Sanctuary -- This bird and wildlife sanctuary is a wonderful place for a hike or for birding. 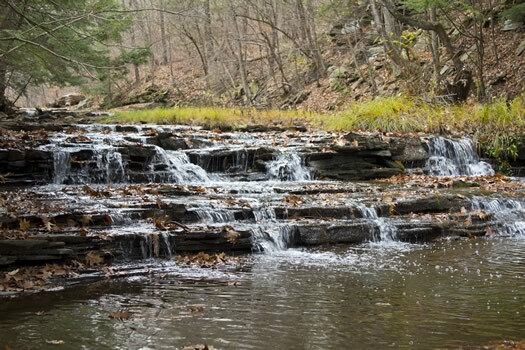 The park features beautiful waterfalls, including a 30-foot waterfall on the Bozenkill. There have been a lot of famous people from the tiny hamlet of Quaker Street in Duanesburg. Stephen J. Dubner (of "Freakonomics" fame grew up there). Actor Frankie Faison was living there for a while, not long ago. And here's an article with photos of Ginger Rogers visiting her husband's house in Quaker Street. Just a minor correction; Gibby's Diner is physically located in the hamlet of Quaker Street, not Delanson as stated in the article. Nice article, very informative, thank you. Word up to my little town getting some love. I love it when Duanesburg gets the attention it so deserves. Wonderful place to live. Consider joining the Duanesburg Historical Society and you can learn many more interesting tidbits about the town. Grew up there for the first 20 years of my life, great community would not want to be raise anywhere else!! And let's not forget about Helderberg Meadworks! Duanesburg's own farm winery (meadery, actually). We make the best mead you can buy! I was married in that church! By the way, there was a rumorâ€”about 10 years backâ€”that Harrison Ford was going to buy land in Duanesburg. It is a fact that he flew into Duanesburg and stopped at Johnathan's. From what I understand there are entries in James Duane's journals about a "cave" type area he hid in during some skirmish (possibly involving indians). The area was explained in detail. My father and one of the town historians found this "cave" on our farm. I lived in a house on Quaker St. for several years that was across the street from a former diner. There were many strange hidden rooms in the basement, and we wondered if it was part of the Underground Railway.